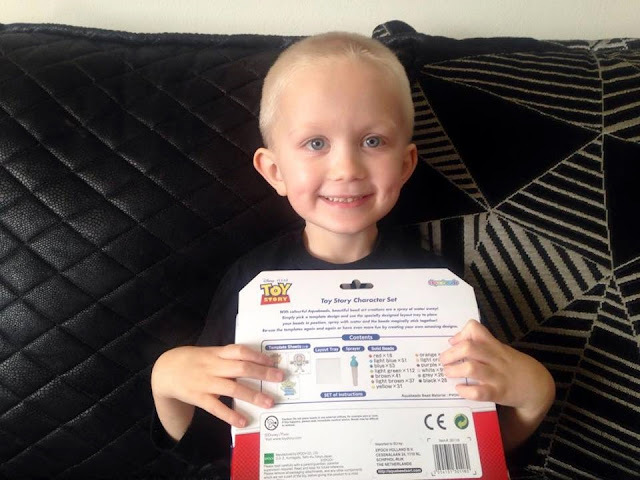 Our blog has featured several Aquabeads products over the last few months, and yet it always comes as a shock to us, as to just how big the range is. We used to regularly see the main Aquabeads kits advertised, but never realised what a collection of add on products Aquabeads actually have, and the wide variation of characters and themes that they cover. Our last Aquabeads blog post, featured the Animal Friends refill set which we really enjoyed, however this month, we were sent the fabulous Toy Story Character Set to try out, and Riley was delighted when it arrived in the post. 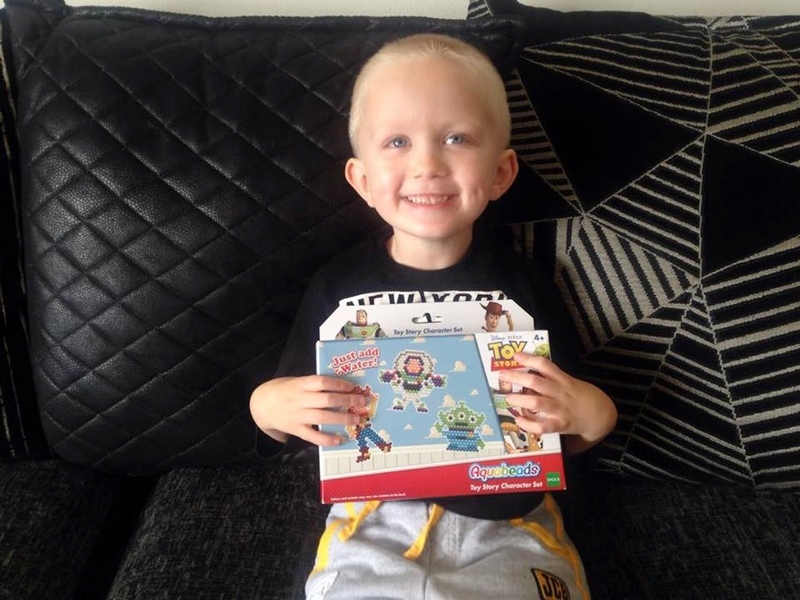 Toy Story is one of Riley's favourite films, and it is also a film that I could watch again and again too. It was therefore lovely to have the opportunity to get down to some creative fun, completing some of our favourite characters from the show. The Toy Story Character Set box is medium sized, and so it is not too big to store away, but also not too small as to get lost easily. 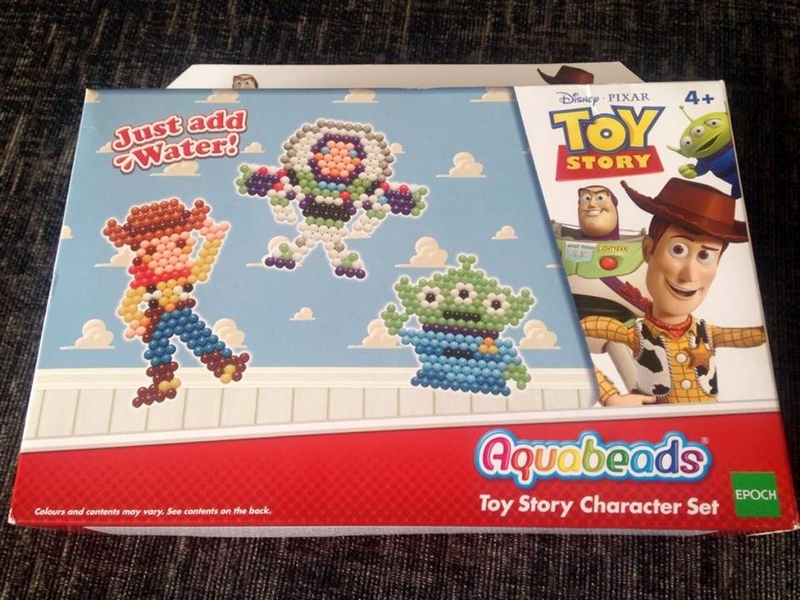 It features the easily identifiable Buzz Lightyear, Woody, and an alien, in both their Disney Pixar form and how they look like when created with Aquabeads. It is nicely designed and very eyecatching. 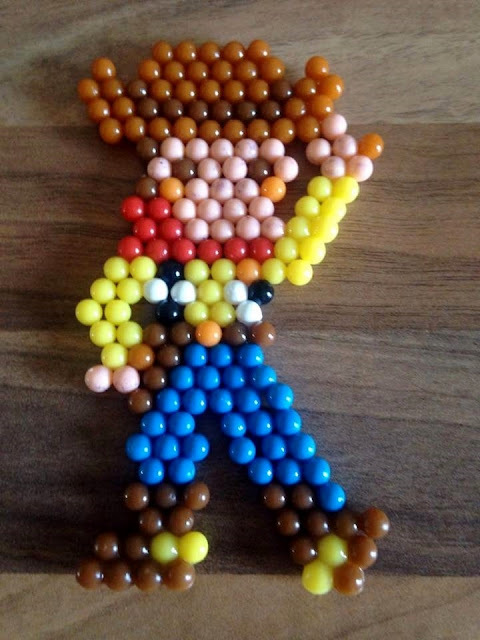 Solid beads including 18 x red, 51 x light blue, 53 x blue, 112 x light green, 41 x brown, 37 x light brown, 31 x yellow, 11 x orange, 45 x light orange, 54 x purple, 99 x white, 26 x grey, 28 x black. 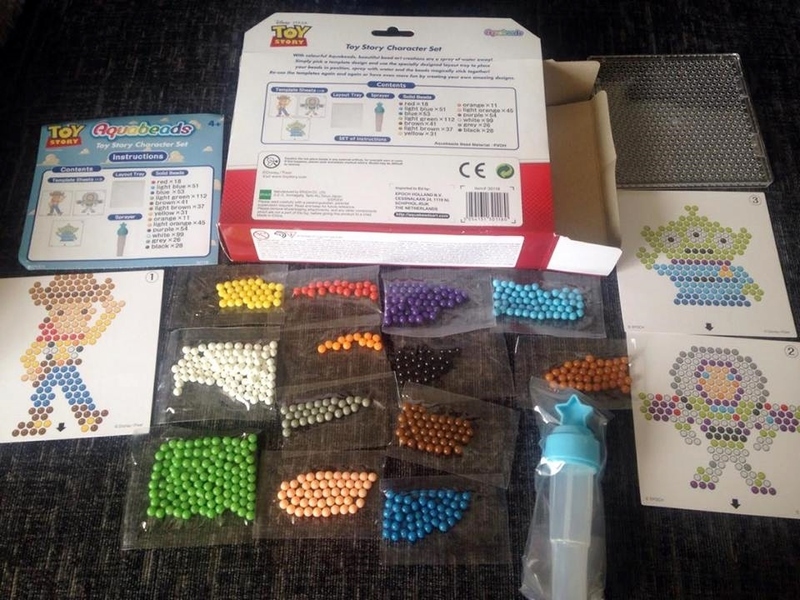 The great thing about this set is that it comes with a layout tray and a sprayer, which is great if one of your others has gone astray, or if you simply want to build on your collection of Aquabeads tools. It also means that you can use this set without the need for any prior purchase either. The sets which come with trays are really useful for us, as it means that we now have enough trays for all my children to enjoy it at once, and so they can each have a tray and template sheet without having to wait for someone elses design to dry before they can have a go. Inside the box, everything was neatly packaged and easy to take out and set up. Riley sat at his little table and took a few minutes to decide which character he wanted to create first. 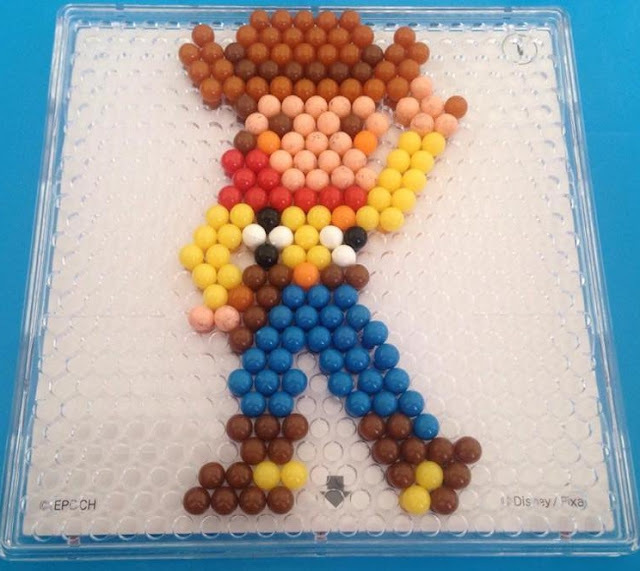 He finally decided to make Woody and so we selected the bead colours that we would need, in order to make it easier for him to find the right beads as and when he needed them. Having created both large and small designs before, we both decided that we prefer to use the larger templates like these ones. This is because they take more time to do, and so the fun lasts longer, It also makes the designs clearer to see, which is a big help for Riley. This therefore made it the ideal set for him, and he made a start on Woody. We began by arranging the beads and placing them into our main carry case that came with the original Aquabeads set we purchased. The case is great as it means you can easily transport all the beads and your equipment, and you can then also easily top up the colours when you start to get low too. Once we had all the colours arranged, Riley began to place beads one by one onto the design. He did get a couple of the brown colours mixed up initially as the hat is made up of both light and dark brown, however we noticed this quite quickly and managed to swap them all round before spraying any water on them. This design took Riley about half an hour with minimal help, and so he was very proud that he had managed to do the majority of the design by himself. We filled up the water sprayer and he ensured that he sprayed all the beads to make sure they stuck together. We then placed the template board at an angle in the kitchen, on top of some paper towel and by the radiator, and left it for just over an hour. Once it was dry we removed it from the board and left it for a further half an hour. 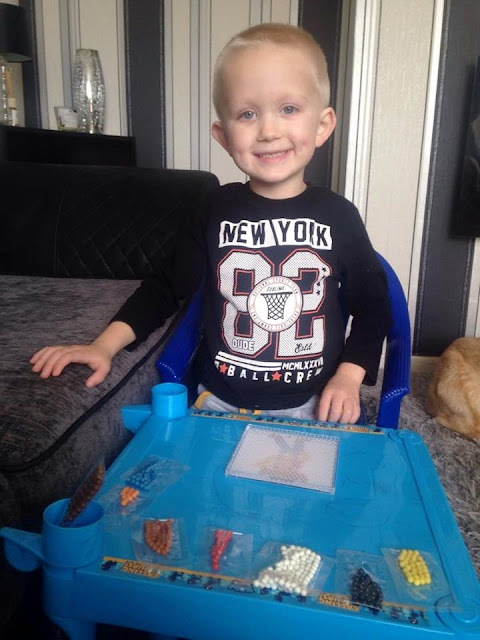 Upon our return Riley was really pleased with the outcome and quickly added it to his Aquabeads collection. Overall, we really enjoyed this set, and it is definitely one of our favourites. The templates were the perfect size, and it was great that they were characters that Riley recognised. 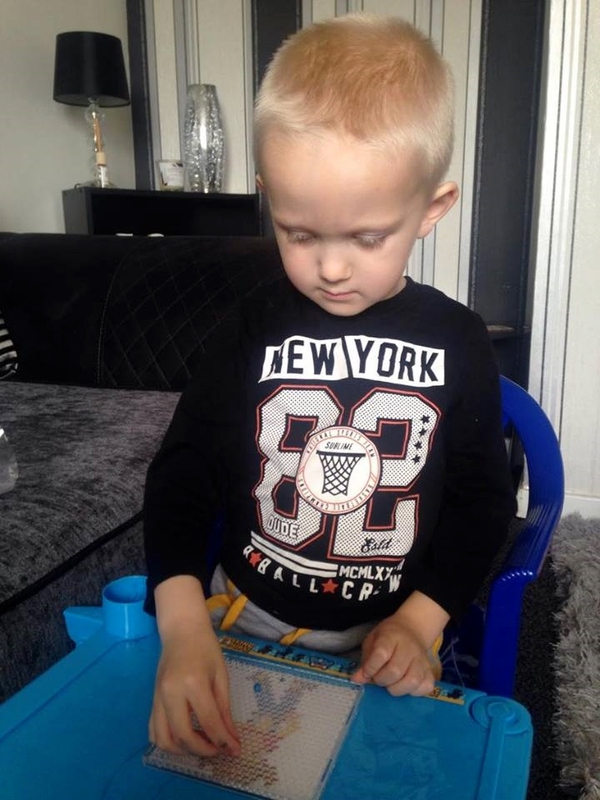 It came with an ample selection of beads, and the inclusion of the layout tray and the sprayer means that you don't need to have any previous Aquabeads products to be able to enjoy this one. This product has an RRP of £9.99 which is a really reasonable price for such a lovely set. The size and cost of this set also makes it a lovely gift idea, and I know that some of Riley's friends would definitely enjoy this set too. If you would like to purchase one of these sets, then they are currently available from Amazon and other good retailers. Disclaimer: This product was provided to us on a complimentary basis for the purpose of providing and honest review of the product. All opinions and photographs are my own. This review also contains an affiliate link, that means I may receive a small commission should you choose to purchase this item after clicking through. These small commissions help me to maintain this site and are gratefully received.